In anticipation of what may prove to be one of the more memorable offerings, ever, at the Monterey Jazz Festival, I ordered Billy Childs’ Map to the Treasure: Reimagining Laura Nyro CD, advertised, promoted for several months before the September MJF event. My copy arrived a few days before the Saturday night performance in Monterey, and by the time I witnessed that occasion, I think I had fallen in love with and memorized much of the exceptional score. Billy Childs has long been one of my favorite pianists/composers/arrangers, and I have been fortunate to have been present at his 1994 MJF “Concerto for Piano & Jazz Chamber Orchestra”; the original compositions he arranged for vibraphonist Bobby Hutcherson in 1998; and his 2010 commission piece “Music for Two Quartets,” with the Kronos Quartet. The original Map to the Treasure CD features no less than ten top vocalists interpreting Childs’ interpretation of Laura Nyro’s songs: Renee Fleming, Becca Stevens, Lisa Fisher, Esperanza Spalding, Rickie Lee Jones, Ledisi, Susan Tedeschi, Shawn Colvin, Dianne Reeves, and Alison Krauss—with instrumentalists Yo-Yo Ma, Brian Blade (drums), Scott Colley (bass), Carl Robbins (harp), Wayne Shorter (soprano saxophone), Chris Potter (tenor sax), Steve Wilson (tenor sax), Chris Botti (trumpet), three violins (Mark Robertson, Jen Chou Fischer, Alyesa Park)), a viola (Luke Maurer) and an extra cello (Vanessa Freebaium-Smith) to flesh out the arrangements Childs and lifelong friend Larry Klum put together. 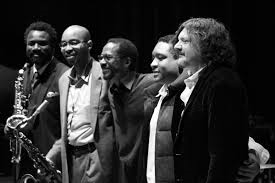 It’s an All-Star cast (to say the least), and Childs brought singers Stevens, Colvin, and Fisher with him to Monterey—each of whom provided a stunning performance, along with Robbins, Colley, and Blade, also on hand, as was trumpeter Ambrose Akinmusire and the Quartet San Francisco. Next up: “And When I Die” was the first song Laura Nyro wrote (placed last on the CD, midway in the MJF set): the plaintive irony of this minor key piece about beginnings and ends beautifully projected by Shawn Colvin. “Save the Country” was introduced, splendidly, by Ambrose Akinmusire’s trumpet solo, followed by Colvin’s astutely phrased anthem-rendering (the song originally inspired by the murder of four major American political and civil rights advocates and the Vietnam War): a simple string arrangement backing Colvin’s poignant plea for better days. On the CD, Renee Fleming renders the opening tune, “New York Tendaberry,” but in her absence at MJF, Billy Childs provided a brilliant solo piano interpretation: clear, clean, very moving lines unfolding with classical precision—an amazing, superb “substitute” for Fleming. Vocalist Lisa Fisher, a crowd favorite, sang “Map to the Treasure” with highly emotional, gospel-laced repeated lines, her phrasing fleshed out with piano/harp fusion and a jazz/chamber ensemble. The set ended with a joyous “Stone Soul Picnic”: free love friendship on a surrey saunter ride to open-field delight. The MJF audience responded to this spontaneous romp with spontaneity of its own: a well-deserved standing ovation. I found the MJF performance as spellbinding as that on the CD: a complete, truly TOTAL enactment on everyone’s part, vocal and instrumental—everything in place and held together by the taste and fine touch of Billy Childs himself. 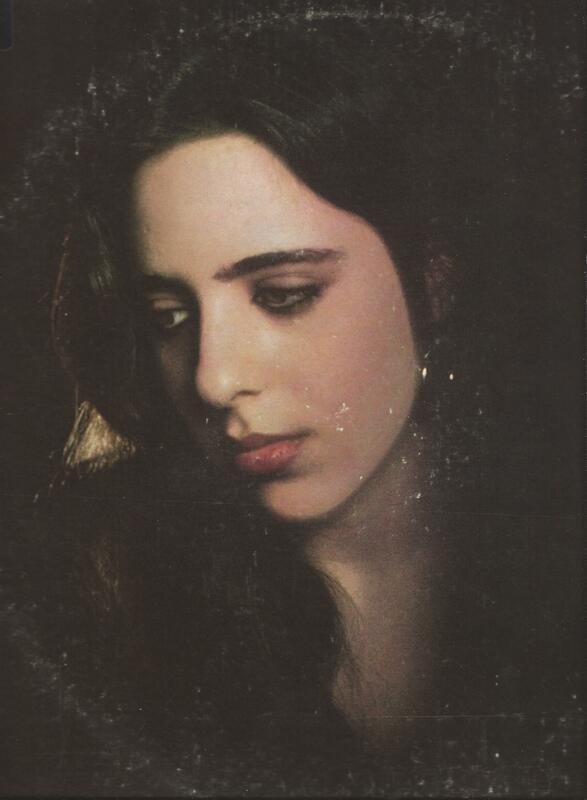 Here he is; the Map to the Treasure CD; Laura Nyro (from the cover of an LP I have, Eli and the Thirteenth Confession; and a photo from the performance on stage at the Monterey Jazz Festival. Critic Scott Yanow would later write: “Laura Nyro would have loved what Billy Childs did to her music,” and when people asked me what I thought of the presentation after, I had five words: “Billy Childs is a genius.” I’ll go so far as to say I feel this piece deserves to be placed “up there” with such legendary MJF offerings as Dave and Iola Brubeck’s “The Real Ambassadors,” Charles Mingus’ “Mediations on Integration,” Jon Hendrick’s “Evolution of the Blues,” Lalo Schfrin’s “Gillespiana,” Gerald Wilson’s “Theme for Monterey,” Terence Blanchard’s “A Tale of God’s Will (A Requiem for Katrina),” and more recent commissioned pieces by Maria Schneider (“Scenes from Childhood” and “Willow Lake”), Bill Frisell’s “The Music of Glen Deven Ranch,” and the pieces by Billy Childs previously cited. 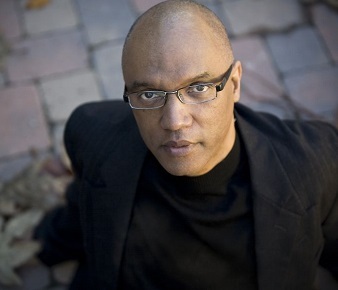 The Billy Childs’ Quartet performed just after the Map to the Treasure triumph, at 10:45 in Dizzy’s Den. They were ready, “up,” for more of the same, and so was I. Consequently, I did not remain in the main arena for a set by the hip-hop/rap group Roots (house band for The Tonight Show Starring Jimmy Fallon), although I was curious, enticed by the names of its members alone: Ahmir “Questlove” Thompson, Tarig “Black Thought” Trotter, Frank “Knuckles” Walker, “Captain” Kirk Douglas, etc. Critic Scott Yanow called the decision to book Roots “the biggest misfire of the weekend,” citing its “lack of jazz content,” and the group’s appearance did occasion a rush of complaint at the Patron’s Booth, although I talked to a few folks who felt the experience of hearing Roots was a Festival highlight. I suspect this set may have been a “test case” (similar to the 1994 appearance of Ornette Coleman with Prime Time, which set Festival old-timers scurrying to the nearest arena exit, even though Coleman had made his first appearance at the MJF in 1959, just a year after the event started! )—the Roots’ appearance may have been a “statement” to show that, a gesture to a younger audience, nearly “anything goes” at the MJF. Also, apparently Roots had folks of whatever age up and dancing (at midnight!) and that does not always happen now even on a Saturday afternoon once devoted to the Blues. Whatever, I had a grand time listening to another set by Childs, more than ably assisted by Brian Blade on drums (a miracle worker whose performance at the previous set was superb—a drummer so good, so inclusive, I feel I just might be able to listen to him play solo for three days, or in the company of another miracle worker I heard on Friday night with Carles Lloyd, Zakir Hussein on tablas); Scott Colley was on bass, and Steve Wilson on alto and soprano saxophone. The group provided a set so tasteful, filled with such a range of forms and sounds that I felt I might be experiencing a blend of Beethhoven’s sonatas and late string quartets (which I love) and any one of my favorite jazz aggregates (too numerous to name, although Wayne Shorter’s term of service with Miles Davis (1964-70), the saxophonist providing half the compositions to some albums, comes to mind, or Shorter’s own quartet of 2000 that featured Danilo Perez on piano, John Patitucci on bass, and … who else but Brian blade on drums?!). The Billy Childs Quartet rounded off its Saturday night set in Dizzy’s Den with the addition of trumpeter Ambrose Akinmusire, a former Oakland teen who was a member of the Festival’s Next Generation Jazz Orchestra, now a full-fledged pro at age 32 who toured with the Monterey Jazz All-stars in 2013, and was featured earlier in the Map to the Treasure performance. 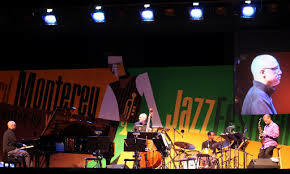 It would be hard to top that set, but I felt this second appearance, of the quartet alone, ranks right “up there’ as well, as a highlight of this year’s Monterey Jazz Festival. And now I must backtrack from Saturday night performances that stand out to Friday night, opening night. Festival offerings are now so rewardingly “dense” (in that word’s original Latin sense, densus, compact, or “arranged neatly in a small space”), that I seem to spend more time on the grounds (which now sport six venues in all) than I do in the main arena, but I always make it a point to hear Tim Jackson’s opening remarks, and stay to taste the “opening act” on the Jimmy Lyons Stage, whatever that may be—this year, the much touted vocalist Cecile McClorin Salvant. At 7:30 pm, Tim kept it short and sweet, saying “Welcome! I see you out there and I feel the energy … We have a beautiful weekend of music ahead of us”—heartfelt words, I feel, and once again, as “Artistic Director,” he’d come up with a superb range of performers when it came to programming, variety and surprise—something for everybody! I’ll confess I had a “conflict of interest” with regard to Salvant, because just as she commenced her set, Charles Lloyd and his group Sangam (with percussionists Zakir Hussein, who I’ve already mentioned as a miracle worker alongside Brian Blade, and Eric Harland, 2014 Artist-in-Residence) had commenced their own set down in Dizzy’s Den (the Festival’s simultaneous “embarrassment of riches” presenting its customary quandary), but I enjoyed what I heard from Cecile McClorin Salvant, a 24-year-old “phenom” at risk of being touted too fiercely prematurely, perhaps, but whose opening tune, “Yesterdays” (a Jerome Kern/Otto Harbach song first sung by Irene Dunne in a show called Roberta in 1933—three years before I was born!—and destined to become a jazz standard), was richly rendered. Salvant drew out (dragged?) the phrasing, as if those yesterdays have gone by quite slowly, in slow-motion perhaps (as they may have, for some), but her range is impressive, from deep cellar notes comfortably rendered to falsetto, the same. Cecile McClorin Salvant paid homage to predecessors such as Judy Garland (“The Trolley Song”) and Carmen McRae (“Guess Who I Saw Today”), and there-in resided a reservation I do have: I’m not sure she, as competently as the standards have been absorbed and assimilated, has yet, at age 24, decided just who or what she is herself as a singer. She teased the meaning out of each note, testing each, but the approach struck me as mannered, somewhat indecisive, technique not always at one with the “story” at hand, struggling (or still searching) for appropriate effects, theatrical but too close, at times, to parody (the “hiiiigggh starched collar” in “The Trolley Song”), although “Guess Who I Saw Today” (Salvant has a keen sense of drama) came across beautifully, right down to its “surprise” last line: “I saw you!” (that person seen with someone he should not have been seen with). Not wishing to miss seeing (and hearing) Sangam, I hastened (as much as a somewhat elderly gentleman with a cane can “hasten,” ho ho) down to Dizzy’s Den, took advantage of my Press Pass (although I do know the “crew” there fairly well by now), and went backstage (the Den itself packed) and stood against a wall behind Zakir Hussain, who was seated, lotus style, before a host of tabla that ranged from a small drum with the circumference of a bagel to a large drum before his lap on which he could alter pitch from resonant basso upward, this drum flanked by medium-sized “squeeze drum” tabla, a total of seven drums embracing and embraced by him in a semi-circle, all of which he maneuvered as if he had the four arms of ego-destroying Shiva, or the six to ten arms of Lord Ganesh, as if Zakir Hussain were several drummers at work and play rather than just one. Across the stage, another drummer just as proficient, Eric Harland, let Zakir show his stuff, and then commenced to show his own on his own terms, on bass drum, toms, snare and cymbals: the two percussionists trading solo time, “team” time, and intermittent response time—this universe of drum talk offered in the service of saxophonist Charles Lloyd, 2014 Showcase Artist, whom I would see in three different settings before the weekend ran out. 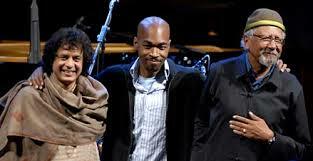 Pictured above are: Zakir Hussain, the Sangam CD cover, and Hussain, Eric Harland and Charles Lloyd taking bows. Lloyd, a former resident of Big Sur whose playing still bears the tone and overall “flavor” of that generous sequestered place, and displays its range of mood (from sedately meditative to blatantly majestic), made a bed or nest for himself within the ongoing percussive landscape provided by Zakir Hussain and Eric Harland. 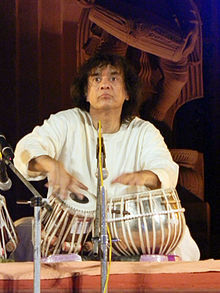 I don’t think I’ve ever heard so many different shades of sound (an extended family of sounds) as those that emerged from Hussain’s assortment of tabla: everything from bashful bonks, metallic plonks and hollow gurgles and growls to quicksilver slaps and pats; slicing, belching, burping; sustained purring, melodic sanding and shading, hiccups, stepladder ascents in pitch and sudden or drawn-out declines, bottomless boiling to mountain top squeaks. Harland would provide his own magic within or alongside that of Hussain: steady wire brush finesse, soccer-skillful bass drum footwork, setting and holding the pace on his ride cymbal, or going all out on the complete kit. 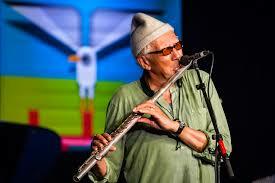 Charles Lloyd might sit out and just listen, appreciatively, for a bit, then jump back in, “return” as if emerging from some prolonged mental journey (to, literally, God only know where), return on tenor sax or tarogato (a bright red Hungarian folk instrument with “deep Arata-Magyar origins,” shaped like a wooden soprano sax), or even piano (at which he is also adept): the reunion appropriately sublime or fierce, a celebration, buoyant, liquid, earthy, a joyous reciprocity—inspirational mutual accord. The group’s name, Sangam, suggests confluence, a meeting point or place, a gathering or coming together; triveni sangam in their case: a junction of three rivers that merge and flow as one—a totally free and unimpeded flow—and that is exactly what one hears. 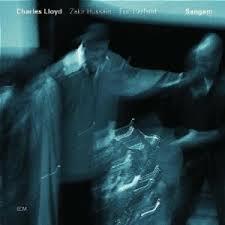 In Steve Lake’s excellent liner note for the CD Sangam, Hussain refers to Lloyd’s “stadium-sized heart,” one that allows both Harland and himself to “canter and gallop,” rather than be restrained or “reined in” like obedient colts. Asking what key he should tune his tabla to (they have pitch) for a particular piece, Lloyd responded, “Oh, just tune to the key of the universe” (which, Hussain claims, is Bb—which is interesting, for that’s the key of the tinnitus I’ve had for twenty-seven years, an “affliction” I shall now look upon with favor, being “in tune” with the universe at large as I am). The opening night Sangam set in Dizzy’s Den was another very special “right up there” (when it comes to highlight offerings at the Monterey Jazz Festival) event for me, and the last word I was to jot down about it in my notebook was “stupendous.” I have several CDs at home by Charles Lloyd, but was delighted to discover much of Zakir Hussain on YouTube, including an impressive six video documentary called The Speaking Hand, which tells the story of his life from his birth in Mumbai, India; being introduced to tabla by his father, Usted (which means “Master”) Alla Rakha; already touring (a child prodigy) at age eleven; to Hussain’s own present state as an “Usted” himself. I did manage to catch a portion of Charles Lloyd’s set with excellent pianist Gerald Clayton (this just before the Billy Childs Quartet Saturday night in Dizzy’s Den), and enjoyed their tasteful melodic excursions; and then I heard and saw, on the main arena Jimmy Lyons Stage (as the opening act on Sunday night) a complete set by the Charles Lloyd Quartet, with Jason Moran on piano, Reuben Rogers on bass, and Eric Harland (again) on drums. Our weekend house guest, Dan Ouellette—who writes for DownBeat and conducts the magazine’s Blindfold Test at the Festival) has high regard for this group—and they proved all he said by way of praise true. Their set started with a standard, “What’s New?”, and they played it new and short and sweet. Once again, critic Scott Yanow would get the words just right when he later wrote that the group provided a “wide-ranging set that would show that the 76-year old saxophonist is still at the peak of his power.” It was immediately apparent why critics such as Dan Ouellette and Scott Yanow find Lloyd worthy of continued respect and the group itself one of the more admirable (and exciting) aggregates on the scene today. 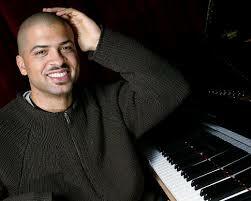 As a pianist myself (of sorts), I could not help but notice, or “hear” right away (as a separate “item,” but perfectly in place with the whole) Jason Moran’s “comping”: tasteful offsetting melodic lines; right hand repetition both heightened and relieved by left hand invention; trills, sudden glisses, full fulgent chords, a percussive approach mixed with abundant nuance; dynamics galore—the whole bag of tricks, a genuine artist’s standard musical “vocabulary” seasoned with a “flavor” strictly his own: one that acts as the perfect complement to Charles Lloyd’s own unique tone composed of soft, meditative passages, overt plaintive wails, and original riffs. 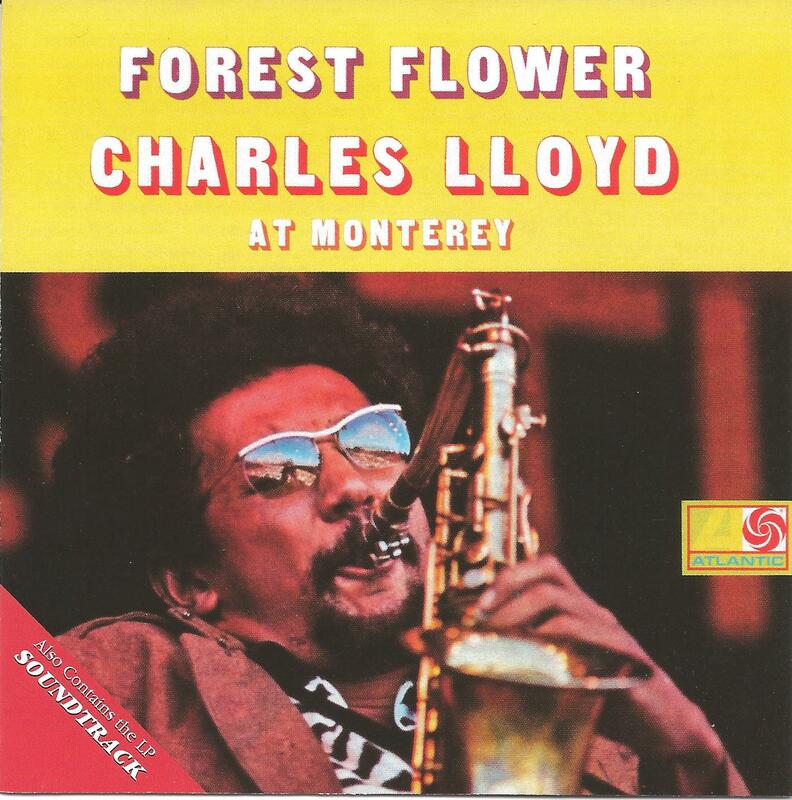 Here’s Charles Lloyd on flute; the cover for the original 1966 Forest Flower: Charles Lloyd at Monterey; the quartet together; and Jason Moran alone. Jason Moran is “weird” in that I don’t know of all that many pianists who can take the fully comprehensive, inclusive approach he does, who can mix such an eclectic outlook or so many disparate “means” so successfully, and yet retain his own singular voice. And the Lloyd/Moran matchup is, in turn, fully agreeable with Reuben Roger’s large-handed sturdy full-bodied bass work (yet he, too, can play “sweet” and soft on solos) and the remarkable drumming (those soccer-agile bass drum kicks at work again) of Eric Harland. It’s a class act all the way, right down to Charles Lloyd’s seemingly casual, comfortable presence on any stage, large or small—the saxophonist living room “cozy” in his peaked knit hat and loose open-throat shirt, strolling about (when not playing) as Theolonious Monk did, but not intrusively, just offering encouragement “behind the scenes,” granting his sidemen maximum space of their own—then providing variety and surprise because, when he “returns,” comes front stage again (the audience never quite sure just what instrument he may have in hand: tenor sax, red taragato, flute, or maybe just an egg shaker filled with seeds or beads), the reentry will make full use of, “exploit” if you will (in his own serene manner), all of its ingredients—the group’s music so continuous that, no matter what instruments are employed, or even the tunes enacted themselves, the effect will be that of one continuous tune, a “suite,” a celebration of the spirit we all possess but may find ourselves, as audience, too shy or reticent, too hesitant to acknowledge in public—which is not the case at all with Charles Lloyd—and the audience loves it! Lloyd may suddenly offer an occasional saxophone growl, but it’s as if he were merely clearing his throat in order to continue in the same sweet groove he was entertaining a moment before. Some of the songs offered were identifiable—such as “Forest Flower,” the piece with which Lloyd first established his reputation, or legend, at the MJF in 1966; and “Go Down Moses (Let My People Go),” the familiar spiritual; but if not, they carried Lloyd’s unique instrumental voice, or in the words of writer Andy Gilbert, a sound that soars “into the either, embracing the universe … incandescent.” And then there is the small shuffle dance of joy he may employ, pleased with what his sidemen have just come up with, or perhaps himself. At the close of their set, the Charles Lloyd Quartet (like Billy Childs’ groups before them) was rewarded with a well-deserved standing ovation. Rather than attempt a full survey of the 2014 Monterey Jazz Festival’s weekend of music in this single post, I am going to save other favorite performances for the next verbal outing. I made new discoveries, such as pianist/vocalist Sarah McKenzie and her quintet, and vocalist Youn Sun Nan, along with excellent artists I’ve heard before, such as vocalist Claudia Villela and Harvey Wainapel (tenor sax), Booker T. Jones, trombonist Delfeayo Marsalas and his pianist father, Ellis Marsalas (the Patriarch! 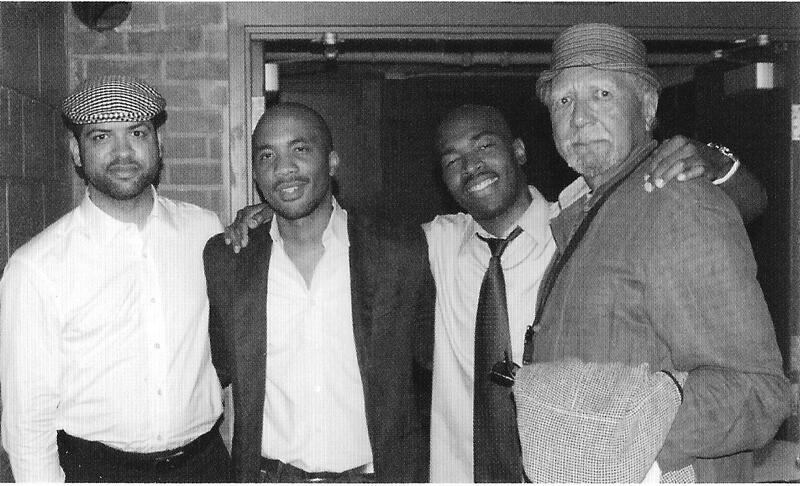 ), fine pianists Harold Mabern and Geoffry Keezer, and also my buddy Dan Ouellette with his DownBeat Blindfold Test with guitarist Lionel Loueke. 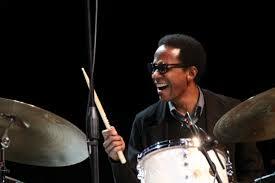 Before I “leave,” I would like, here and now, to focus on one last group which I was eager to hear, live (I had their CDs), and that is drummer Brian Blade (about whom I’ve already raved) and The Fellowship Band, which appeared on the Garden Stage Sunday afternoon. Just as I had been “prepared” to appreciate Billy Childs’ Map to the Treasure: Reimagining Laura Nyro through CD listening sessions, so I was more than “ready” to appreciate The Fellowship Band by way of the CDs of theirs I have, and also an excellent article by Paul de Barros that appeared in the June issue of DownBeat, “Brian Blade & The Fellowship Band: Seeking the Greater Good.” De Barros makes it clear, from the start, that whereas The Fellowship Band “has not been prolific,” they are “a profoundly important band”—one for whom “fellowship” isn’t just a word, but “a creed.” Blades’ father was a minister in Shreveport, Louisiana, “an imposing man with a stentorian voice” (writes de Barros), a man who “preached at Zion Baptist Church and had a radio ministry.” Brian Blade told the writer: “I’m sure the first voice I heard in the womb was my father’s.” Brian’s mother was a kindergarten teacher, and that vocation provided first-rate nurturing as well. The difficult arts of truly listening and giving back came naturally to Brian Blade, of whom saxophonist Wayne Shorter (Blade appears on Shorter’s multi-award winning CD Without A Net) says, “He’s like a tailor. He makes the clothes fit the person he’s playing and interacting with.” Blade has returned to his roots in Shreveport in several ways, having moved back to his hometown with his high school sweetheart (and wife) and seven of the ten compositions on The Fellowships Band’s CD Landmarks were recorded there. Blade attended Loyola University in New Orleans with the band’s pianist Jon Cowherd in 1988, playing “duo all the time,” and Cowherd is the main reason the drummer took up composing. 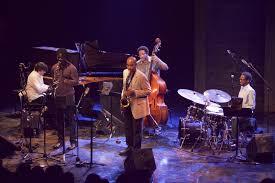 The group is fleshed out with Myron Wilson on alto sax and bass clarinet; Melvin Butler on soprano and tenor saxophones, and Chris Thomas on bass. The tunes composed by Blade reveal his interest in word-songs (an interest similar to that of Billy Childs; Blade himself has performed with Joni Mitchel, Emmylou Harris, and Bob Dylan). Here’s Brian at the drums, smiling of course; The Fellowship Band together; the cover for the CD Landmarks; and the group on stage. There was fellowship galore within the group on Sunday afternoon at the MJF. You could tell, immediately, just how much they love making music together: a “joyful noise,” both secular and sacred. Their set commenced in a comfortable vein, with tasty piano chords and just a hint of melody, bass clarinet and soprano sax emerging in perfect synchronicity: a handsome entry introduction of a handsome theme, laced with Blade’s subtle drum fill, this performance making it seem as though he were merely taking up where he’d left off the previous evening in the company of Billy Childs’ quartet, trading that tight unison for being perfectly in tune, in touch, with Myron Wilson’s delicious bass clarinet deep timbre and mood. Cowherd offered a fine extended piano solo, his introspective interlude giving way to a smooth ensemble close out. Which is a good place for me to end this blog post—with some thoughts on collaboration, musicians working (playing) together for a common purpose or end, an activity characteristic of the groups led by Billy Childs, Charles Lloyd, and Brian Blade which I have focused on, and which I thoroughly enjoyed (cooperation or collaboration not an activity I see much evidence of elsewhere in the world today). As a writer, I find myself spending too much time alone, perhaps, staring at a blank sheet of paper, wondering when the words might arrive, waiting for the right “notes” to fill that empty space with, locked into my own isolated world, overlarge with fragile more than likely “fake” ego (someone out there actually cares! )—and I envy groups such as those I’ve just written about and, hopefully, found the right words for: envy their genuine fellowship, “familyhood,” the love they have for what they are capable of, together, perpetually listening to what each has to say alone and the beauty made when they talk as one. On occasion, as a sometime musician, I’ve known that togetherness—and there is little else in the world (aside from that of close family and friends) that can match it—and it was a privilege to witness this “phenomenon” (from the Greek “phainomenon”: appearance) in all its acquired meanings: “something impressive or extraordinary”; “a remarkable or exceptional person; prodigy; wonder”; an appearance or immediate object of awareness in experience; Kantianism. a thing as it appears to and is constructed by the mind, as distinguished from a noumenon, or thing-in-itself”—to have had that experience at the Monterey Jazz Festival on the weekend of September 19-21, 2014. 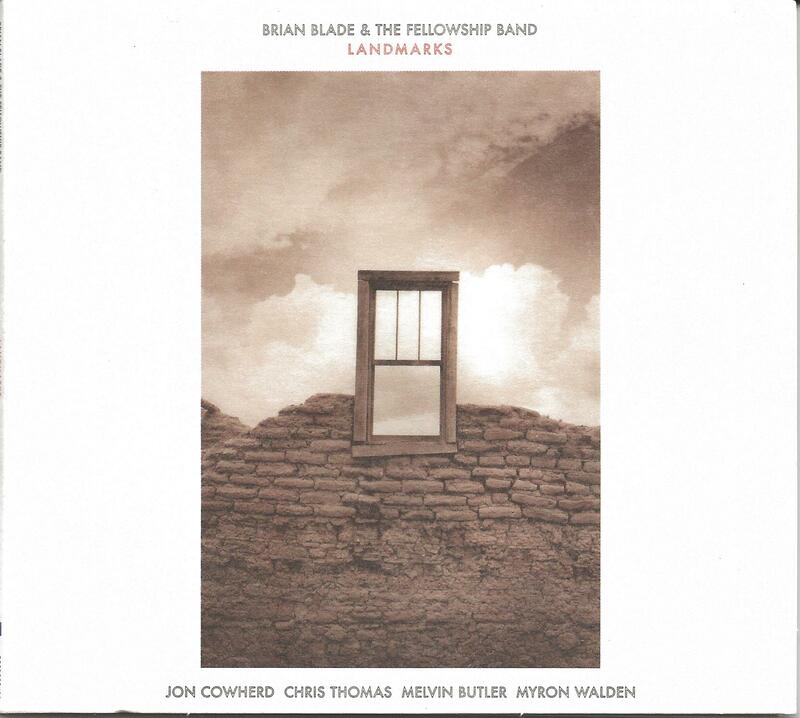 Perhaps the best way to sum it up is to return to Paul de Barros’ article in DownBeat, “Brian Blade & The Fellowship Band: Seeking the Greater Good,” in which he said: “As a composer, [Blade] insists the music is ‘not just notes,’ but carries important, even urgent messages. As a person, he prompts unconditional praise.” These two entities—art and a praise-worthy person—do not always coincide or arrive together, and it’s a rare and wonderful thing to behold when they do. Next blog: more Monterey Jazz Festival.